Not that we encourage Caroline to mispronounce words, but Joey and I catch ourselves saying certain words the same way she does, even if it's not the right way. Like we call Smith "Baby Sniff" more often than not. Her cousin Georgia is "Joorjha." She eats "yodirt" every morning. And "grill the cheese" sandwiches for lunch. She is also very particular. She did not appreciate being served this sandwich for dinner. Because grill the cheese is for lunch. Everyone should know this. Joey and I, however, were more than happy to eat these for dinner. And for the record, I ate one for lunch the next day, so Caroline can rest easy. 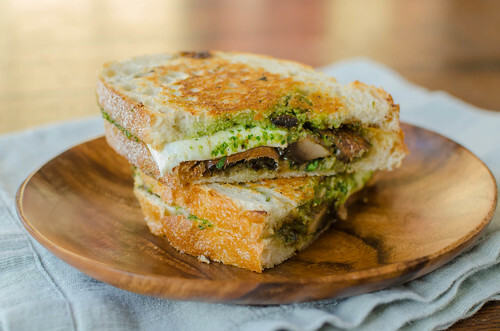 You start by oven-roasting portabello mushrooms and onion slices, then layer them onto thick and hearty sandwich bread with fresh mozzarella, spinach pesto, and a splash of balsamic vinegar. Grill it or cook in a panini press, and you have one heck of a sandwich. This is a very quick and easy dinner, but you could shave even more time off by mixing up your pesto and roasting the veggies earlier in the day or the night before. I'm pretty sure most combinations of roasted veggies grilled on bread with pesto and cheese would make a wonderful sandwich, but this particular variation is really great. It makes a nice light dinner when served with a seasonal salad. Or a great lunch. For the record, Caroline eventually ate her sandwich, and of course she loved it. Because not matter the time of day - who doesn't like a fancy-pants grilled cheese? Combine the spinach, parsley, garlic, pine nuts, and lemon juice in the bowl of a food processor fitted with the steel blade. Puree until everything is chopped very small, scrape down the bowl, and then with the processor running, stream in the olive oil. Remove the pesto a small bowl, stir in the Parmesan cheese, and season to taste with salt and pepper. Meanwhile, preheat the oven to 425 degrees. Toss the mushroom caps and onions with the olive oil, soy sauce, balsamic vinegar, and salt and pepper to taste. Cook on a rimmed baking sheet, with the mushrooms cap side-down, about 10-15 minutes. Cool slightly, then slice the mushrooms. Brush one side of each piece of bread with olive oil, then spread 1 tablespoon of pesto on the other side of each slice. Layer the mushrooms, onions, and 2 slices of mozzarella on each sandwich, drizzle with balsamic vinegar, then top with the other slice of bread, olive oil-side up. Heat a nonstick skillet over medim-high heat and cook the sandwiches, flipping when golden-brown, a few minutes per side. Yum! This sandwich sounds awesome! Isn't baby talk so cute? I know you're not "supposed" to use it with them... but it's so hard not to! This sandwich sounds incredible, I love the use of pesto! This is one delicious-looking grill the cheese sandwich! My family still says some words the way my now 16-year-old sister used to say them when she was little...it never gets old. :) I love grilled cheese all the time...and pesto always makes it better! I've had the most intense pesto craving lately & this sounds incredible! Uhm, wow. This combination sounds amazing! I'm totally on a pesto kick lately, since our basil is blowing up like crazy! My mouth is watering. Pesto in a panini is my idea of the start of a perfect sandwich. Add portabello, parm, and onion, and all the rest of these delicious ingredients... amazing. I made this for lunch today and it was phenomenal! So delicious - Thanks for sharing. I put some fresh dill in the pesto too, with the spinach and parsley and the pesto was tasty just on its own. Wow! ha! My BF's nephew says stuch instead of stuck so we joke around and say it that way now.